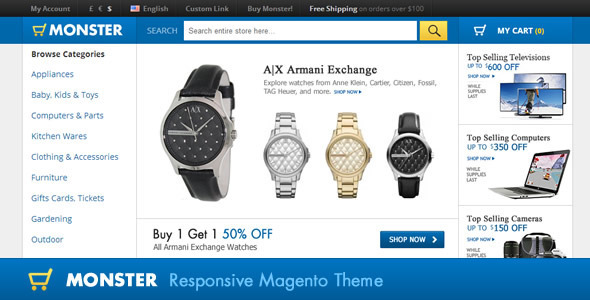 This is a Simple and Responsive Magento Theme based on my OpenCart theme. It is easy to work with and comes with admin options to setup the site within minutes. It is fast loading and can be used for any kind of online business. You can show either Latest/Featured products on the homepage. There is also an option to display both blocks on the homepage from the admin area. Slideshow options. Upload your images from the admin. You can configure the slideshow animation, add links, set auto slide to on/off. Text for the blocks in the footer area can be changed from the admin options. The product images are for demonstration purpose only and are NOT included in the package.